BAM - or boron-aluminum-magnesium alloy combined with titanium boride is super hard and slicker than Teflon. 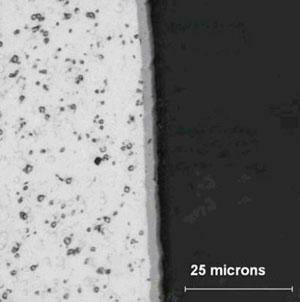 This "ceramic alloy" is the hardest material after diamond and cubic boron nitride. It's "greener" because it could save hundreds of millions of dollars in energy wasted every year in overcoming friction. BAM is being touted as a lubricant coating that never needs to be replanished; it has a coefficient of friction of just 0.02 (Teflon is 0.05). Lubricated steel's coefficient of friction is 0.16. Experts believe that coating rotor blades in pumps in common use in households and industry could save $180 million per year (9 billion kilowatt hours of energy). The substrate is the mottled structure on the left-hand side of the photo and the coating is the thin, darker strip running along the edge of the steel. Sounds like a pretty close match to me. From Tough Nanocoatings Boost Industrial Energy Efficiency via Material slicker than Teflon discovered by accident.